ItemPDP05921 - Standing girl, side view. ItemPDP00560 - Haida Totems, Cha-atl, Q.C.I. Source of title proper: Title based on Carr's caption for PDP00615 the graphite preliminary sketch. Statements of responsibility: Signed "M. Emily Carr Ucluelet BC" in red ink lower right front. Parallel titles and other title information: The parallel title was a misreading of Carr's handwritten inscription in 1961-1962. For over a decade this title was in place and also on print reproductions created for sale. 1 watercolour; watercolour on paper; 17.8 cm x 25.4 cm. 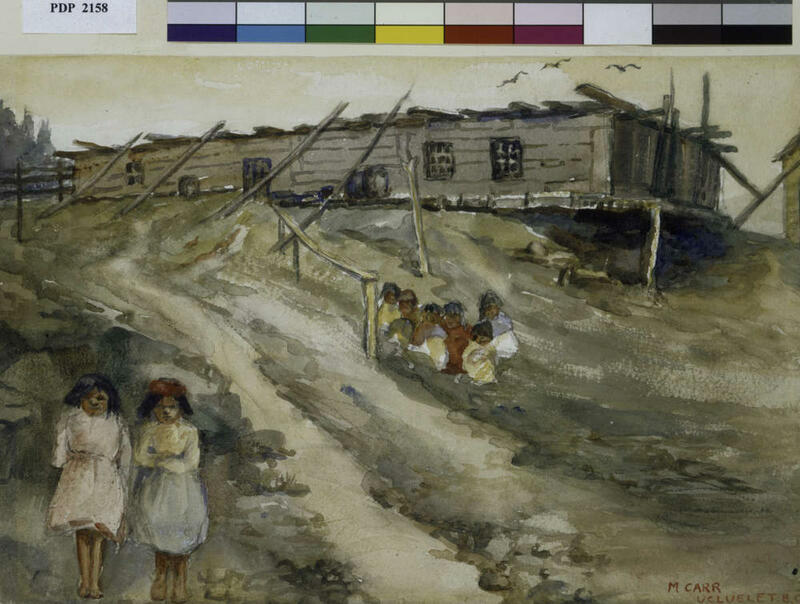 One watercolour painting of two girls in front of community house. Archives code(s): PDP02158; Previously numbered as NC 8. 1990. Emily Carr, National Gallery of Canada, Ottawa. 1991. Emily Carr in France, Vancouver Art Gallery.